With his boldly graphic style, Peterson’s work is newly meaningful in the current political climate, given its frequent depiction of violence. The exhibition, titled Cleon Peterson: Shadow of Men, focuses on this current in Peterson’s work and showcases the artist’s aesthetic mastery, long under-recognized by the museum field. This solo presentation also demonstrates the importance of representing violence to highlight a disturbing though fundamental element of society. The exhibition squarely addresses the nature of violence at a time when this subject seems increasingly uncomfortable, yet urgent. 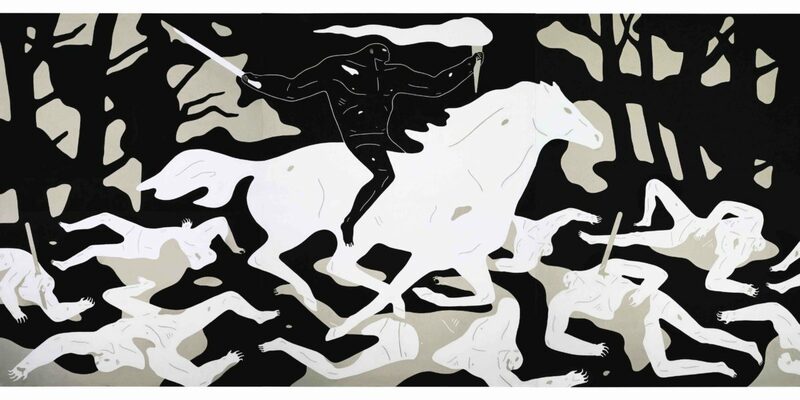 Cleon Peterson was born in Seattle, Washington, in 1973. He earned a BFA at the Art Center College of Design in Pasadena, California, and an MFA at the Cranbrook Academy of Art in Bloomfield Hills, Michigan. His work has been shown at institutions in Chicago, Detroit, Los Angeles, and New York, as well as in Australia, Hong Kong, London, Paris, and Singapore. He lives and works in Los Angeles. Curated by Adam Lerner, the Mark G. Falcone Director and Chief Animator of MCA Denver. Image: Cleon Peterson. Victory, 2017. Acrylic on canvas, 128 x 84 inches.